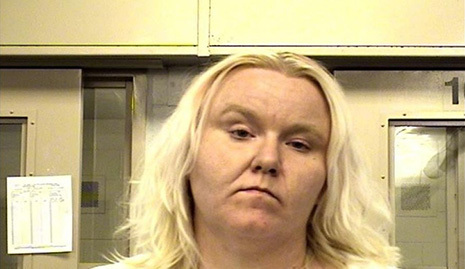 MARCH 7--After failing a drug test last month, a New Mexico probationer claimed that she had been prescribed methamphetamine by a doctor--and had the prescription to prove it. 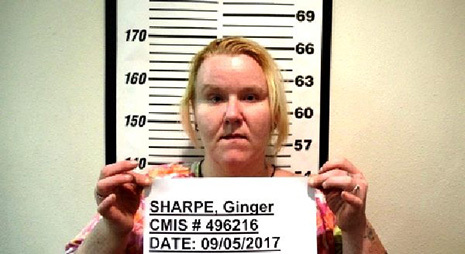 Ginger Sharpe, 34, was placed on probation last year following a forgery conviction, records show. 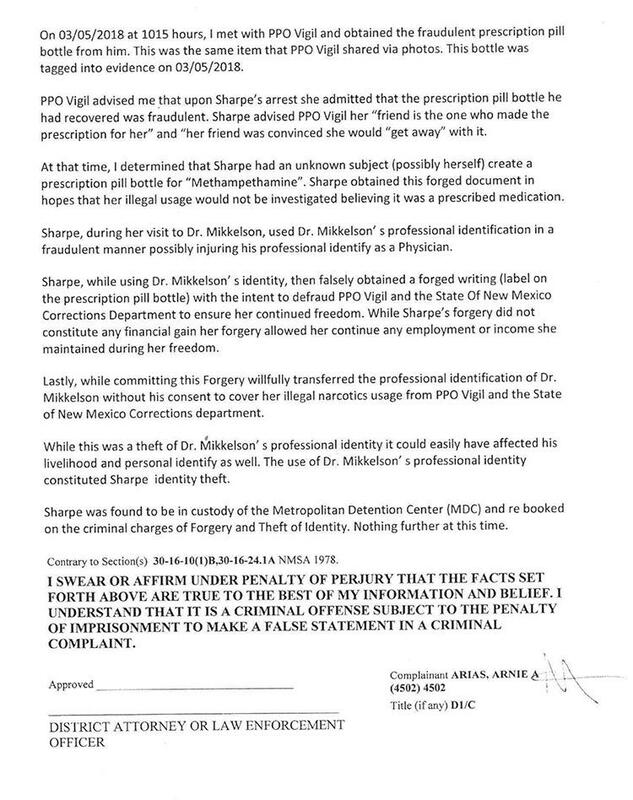 As part of her supervision, Sharpe was required to submit to periodic drug testing, according to documents filed in Metropolitan Court in Albuquerque. 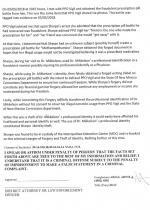 As detailed in a criminal complaint, after Sharpe’s urine came up dirty last month, she was handcuffed and detained for a probation violation. 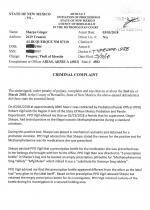 That is when Sharpe, seen above and below, told Probation Officer Robert Vigil that she had been legally prescribed methamphetamine. 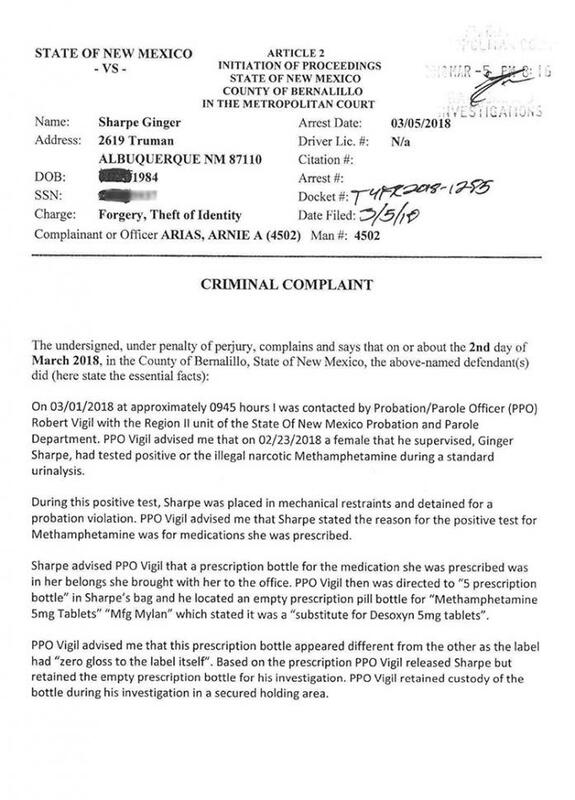 Though the label seemed off--it had “zero gloss” and the lettering was slightly fuzzy--Vigil opted to release Sharpe from custody “based on the prescription.” But the officer retained the pill bottle for further examination. 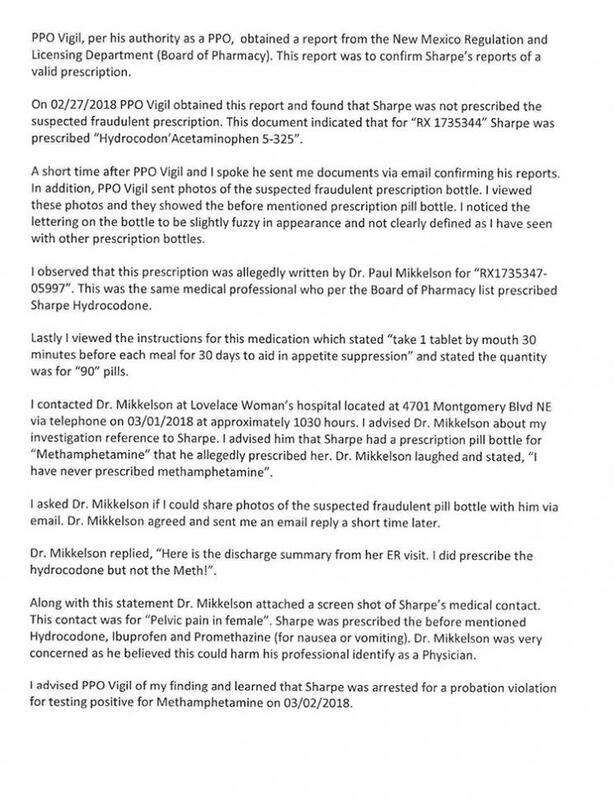 A subsequent probe revealed that Sharpe “was not prescribed the suspected fraudulent prescription.” When contacted by an investigator, the doctor who purportedly prescribed the meth to Sharpe laughed at the preposterous proposition. 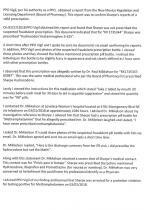 “I have never prescribed methamphetamine,” said Dr. Paul Mikkelson. While Mikkelson had previously treated Sharpe during an emergency room visit, he had only prescribed the painkiller Hydrocodone, Ibuprofen, and Promethazine (a drug to combat nausea). When confronted last week about her purported meth prescription, Sharpe reportedly confessed to the fraud, claiming that a friend “made the prescription for her.” This unnamed pal, Sharpe added, convinced her that the doctored pill bottle would fool her probation officer.